For seven years (beginning in 1939) Basil Rathbone was Sherlock Holmes - not just in a successful series of fourteen films, but in almost 220 half hour radio shows as well. 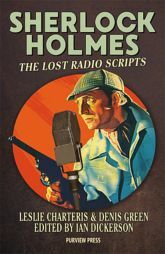 Sadly, many of those radio shows no longer exist and, for much of the 1944/45 season, not even the scripts could be found. Until now. Here are twelve of the scripts for those missing radio shows. Twelve adventures of Sherlock Holmes and Doctor Watson,unheard of and unread for over seventy years, written by Leslie Charteris (creator of The Saint) and Denis Green.